1. Mix butter and lemon juice in one bowl. 3. Dip the fish into butter mixture; coat fish with flour mixture. 4. Place fillets on a broiler pan coated with cooking spray. Pour remaining butter mixture over fish; sprinkle with paprika if you like. 5. Broil 3-4 in. 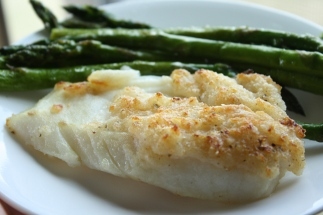 from the heat for 10-12 minutes or until fish flakes easily with a fork.